A four letter word to describe my February - FOUL! It wasn't just the weather (although we have been extremely fortunate here) that dripped incessantly but my nose too. No I've not had a cold but a number of unexpected and quite dramatic nose bleeds. The last one was like a scenario out of a horror story, when having just about to step into the shower my nose started to bleed and on this occasion was in no hurry to stop. It was great fun getting dressed again with one arm at my disposal. To cut a long story short I ended up travelling via ambulance to the nearest A&E department where the offending orifice was eventually cauterised. This sounds painful but was just uncomfortable - touch wood the procedure seems to have worked. We left A&E late at night with some antibiotic cream and advice to take it easy and not to stretch, bend and to try to avoid being exposed to contrasts of temperature for the next ten days. So all in in all February has not been a month that will be remembered for its gardening activities. In fact I even too grotty for a couple of days to make the short journey from house to greenhouse so that I could peruse my special snowdrops. That situation did not last long I'm glad to say and after muffling my nose in a swathe of woolly scarf I ventured out for a daily inspection. These snowdrops gave me great pleasure this month. A few more have arrived in the post to swell the ranks so hopefully I will be able to show you some of them from late autumn onwards. A couple of them are very early or late flowerers, depending on which way you look at it. Meanwhile the garden has carried on doing its own thing without any interference from me until the last week when I've ventured out for some gentle pottering. The snowdrops in the garden are now at the point of going over but there are hellebores, irises, crocuses, primroses, little daffs and pulmonarias giving some welcome colour. It seems that everything is ahead of last year but then last winter was so prolonged so it's not a good comparison really. There has been a tiny bit of planting this last week which must have been the driest week we've had for weeks. I've introduced some of the special snowdrops in to the garden and himself has done some tree planting under my supervision. We've moved a couple of pear trees back a few feet and have introduced a new companion- malus 'Red Sentinel' to them. I can't really say anything about my allotment plot other than I have not been there. Hangs head in absolute shame! I have sown some beetroot and broad beans in the last couple of days so it has not gone out of my mind altogether. Some spuds arrived in the post yesterday and have made it as far as the unheated back bedroom. Plant purchases this month - more special snowdrops, malus 'Red Sentinel', pittosporum 'Irene Patterson', a small amelanchier lamarckii, and a couple of ferns namely dryopteris atrata and dryopteris erythrosora var. prolifica. Without a doubt March is going to be busy. Thanks to Helen as always over at 'The Patient Gardener's Weblog' who enables us to share our end of month views. PS Having just popped outside for a few minutes I realised that I omitted Mahonia 'Soft Caress' from the list of plant purchases - please forgive the shortened name. It is headed for the courtyard but presently awaits a suitable pot. Prompted by Helen over at 'The Patient Gardener Weblog' here is the first of what I hope will be a series of post about my greenhouse year. My present greenhouse came home with us after the Malvern Spring Gardening Show in 2009 - well to be more accurate a receipt for a deposit came home with us, whilst the greenhouse followed a few weeks later. It is the best gift ever that himself has given me. We did not go to the show with the intention of buying a greenhouse - in fact the thought of getting another greenhouse had not entered my head. 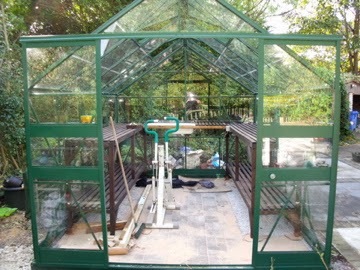 I was quite happy with its predecessor which was a 6 feet by 8 feet second hand greenhouse and had served me well for years. However himself persuaded me that I should go for a bigger model. He pointed out to me that as I was no longer working that I would be spending more time in the greenhouse and would appreciate having more space to fill. How could I resist such logic? There was also the extra incentive of a special show price so it was a done deal by the end of the day. At the moment the greenhouse contains my collection of named snowdrops which are overwintering in a frost free zone. There is a small electric fan heater which comes on when the temperature dips below a certain level. Fortunately it has not seen much action this year although it had to work extra hard last year. The snowdrops are really taking too much room at the moment but I would like to leave them indoors for another couple of weeks, before letting them take their chance outside. I will start sowing seeds in earnest then although I plan to sow some broad beans, more sweet peas and beetroot before the end of February. For various reasons I am cutting down on seed sowing in the greenhouse this year, although I still have a feeling that I might eat my words yet. Apart from the snowdrops there are presently a few other occupants in the greenhouse. Autumn sown sweet peas linger but will be turfed out soon to start toughening up. There are also other autumn sowings of orlaya grandiflora, a fluffy grass name of which escapes me for now and the half hardy nicotiana mutablis. I've overwintered a couple of mature plants of the latter hoping that they will be in flower in time for our garden club plant sale in May. If so I will be able to take a flowering specimen to help sell the babies. Also lurking on the sidelines are some penstemon cuttings that are ready for potting up. One is 'Sour Grapes' whilst the identity of the other remains a mystery, other than the fact that the flowers are very,very pink. Pots of dahlias are also resident along with a couple of lemon verbena plants. No sign of life from either yet but it's still to early. I should also confess that I have a second greenhouse on my allotment plot.That was inherited along with its resident grapevine which I will reveal later in the year. It is just a mass of bare branches at the moment. So that it is the state of play in my greenhouse towards the end of February. Next month a peek inside. However I've been on the look out since and found an online source at Burncoose Nurseries in Cornwall. 'Irene' was ordered late on Tuesday evening, left Cornwall on Thursday afternoon arriving here in the north west of England just after noon yesterday. She and her travelling companion were both extremely well packed. I'm slightly apprehensive as I broke one of my unwritten rules of not buying plants that have been grown in the warmer south and also because I'm not sure how hardy 'Irene' is. Time will tell. Meanwhile I'm looking forward to seeing her grow and although her foliage was the main attraction, I am also looking forward to seeing her tiny purple flowers. One garden writer describes them as honey scented whilst another detects a cocoa aroma. Either sound more than acceptable to me. My second plant was spotted when garden visiting a couple of years ago. It is bergenia purpurescens 'Helen Dillon' form. This is somewhat of a chameleon of a plant with green leaves which slowly turn a deep burgundy over the winter. I knew when I saw that I wanted to grow it with hellebores and snowdrops. I've agonised where to plant it and am not sure whether it will stay where it is. At the moment it's adjacent to a double pink hellebore, in proximity to the emerging leaves of cardamine pratensis flore pleno with a solitary galanthus' Blonde Inge' to the front (not visible in this photo). Of course the snowdrop will make a huge clump eventually - well that's the plan anyway. The thinking was that the bergenia foliage would reflect the coloured speckling. Pondering over this now has made me think that the latter combination would have been preferable. Maybe I will be able to divide the bergenia in the future or treat spotty dotty hellebore to a new leafy bergenia companion. The leaves on the bergenia take on an almost orange glow when back lit by the sun which is most attractive. Although leathery some creature has been nibbling the leaves which surprised me. I don't remember it happening last year so hope it's just a once off. With many thanks to Christina over at 'Creating my own garden of the Hesperides' who kindly hosts this meme each month. This post was prompted by reading a post over at Veg Plotting last week which you can see here. A group of bloggers and tweeters had been discussing one of those Amazon book lists via Twitter and came up with the idea of producing a blog post listing favourite books. It was agreed to limit the lists to twenty books each. My favourite twenty books? What a question! I thought and thought some more about this, coming to the conclusion that it had to be not only books that made a lasting impact on me but also be books that I could not possibly part with. I was an avid reader as a child and all the way through my teens and twenties before slowing down for some years. I think that the amount of reading and computer use that work involved sadly dampened my enthusiasm for reading for pleasure. My book consumption rate slowed down for some time but has picked up dramatically since I left work over five years ago. Now I'm rarely without a book on the go, although not surprisingly, I get through more books in the winter months than in the summer, when of course I would rather be outdoors. I'm going to post this list in two parts starting with those books that cast their magic over me as a child, teenager and a young adult. 1) 'Brer Rabbit Again' - Enid Blyton - now I have to confess that this may not have been my all time favourite Enid Blyton book but I just had to include this author. The author's work has come in for criticism in later years but I am convinced that Enid Blyton's writing sparked off my lifelong love of reading. This book is the only one that I still have in my possession possibly because it's a hardback. It relates the adventures of a rather mischievous rabbit. I'm still not sure why nearly all the other animals in this are also all called 'Brer' whether they be fox, bear, wolf or rabbit! 2) 'What Katy Did' - Susan Coolidge - this book was given to me by a dear family friend when I was nine. I spent the best part of six months in hospital at this time and then another three months or so recuperating at home, before I was able to go back to school and normal life. I can vividly remember reading about what Katy did and if you read it too you will remember that a twelve year old Katy met with an accident, which left her confined to bed for some considerable time. So I felt that I had something in common with Katy and loved this book and its sequels too. The book had just the one illustration which you can see above. The colouring was my art work. I think and hope that it was a one off. No way to treat a book! 3) 'Miscellany One' & 'Miscellany Two' - Dylan Thomas - an inscription inside these books reminds me that these books were my first ever school prize. We had previously studied 'Under Milk Wood' at school listening to Richard Burton's incomparable recording, which influenced my choice of prize. The miscellanies include poems, stories and broadcasts by this Welsh wordsmith. Some of the poems especially 'Poem in October' and 'Fern Hill' are still amongst my favourite poems and the boyhood reflection of 'Memories Of Christmas' usually gets an annual seasonal outing. I know that this selection is two books but I thought that it would be legitimate. 4) 'Selected Poems' - TS Eliot - this was one of our set texts for 'A' level English Literature and was my first introduction to this poet. I can still quote fragments of some of these poems more than 40 years later. Above you can see a page from my copy of this book. We were told by our teacher that we would be able to keep this book at the end of the course and he encouraged us to write notes in pencil as we worked our way through this book. I had never written in the main body of any book, before or since so such scribbles seemed deliciously wicked. It is such a strange sensation looking back on my notes written as a 17/18 year old but I'm so glad that I kept this book and so grateful that I had two brilliant teachers to take me through the course. Again a book that I pull out of my bookshelf several times a year to revisit some favourite poems. 5) 'The Chambers Dictionary' - I left home for university with my very first dictionary which was a gift from my parents. Before that I had always shared a dictionary with my brothers and sister so it was rather special to have my own. Somewhere along the years this copy was replaced with a more up to date edition when I got to the age of 40, again a gift from my parents. It will be possibly soon be time for a new edition to catch up with many of the new words that have been introduced into the English Language since. My Chambers has seen me through many years of reading, writing, playing Scrabble and tackling crosswords and is absolutely indispensable. 6) 'The Lord Of The Rings' - JRR Tolkein - this stays in my mind as I first read this as a student. Finally I was able to read late into the night without any nagging reminders from my mother to turn the light off and get some sleep. I burned the midnight oil and then some more in the reading of this and remember the sheer excitement of the sense of freedom this bought with it. 7) 'The Prophet' - Kahil Gibran - another memento of student days which has remained on my bookshelf ever since. Why this book by poet, philosopher and artist Kahil Gibran is so well loved is described far better than I can here. 8) 'The Mersey Sound' - Adrian Henri, Roger McGough and Brian Patten - I bought this book after attending a poetry recital by this trio of poets in my first year as a student. This was poetry of my age and time with references to the here and now - so far removed from Byron, Keats,Tennyson et al. It was a complete contrast to any poetry I had come across before. Little did I know that it was to become the best selling poetry anthology of all time and that I was to go on to live and work just outside Liverpool. 10) 'Once Upon A Time' - The Fairy Tale World of Arthur Rackham' - introduced by Margery Darell - student days were well behind me, when I bought this book back in the days when I regularly bought books from a book club. It contains some classic fairy tales, 'Alice's Adventures in Wonderland' as well as 'Aesops Fables'. I think that the main attraction though was the inclusion of Charles Dickens's 'A Christmas Carol' which I reread every festive season. That and the exquisite black and white as well as colour illustrations by Arthur Rackham. Numbers 3, 9 and 10 are out of print but second hand copies can still be found. So that's the first half of my top twenty which I've thoroughly enjoyed compiling. I think that I will need a breather though before selecting the second batch so will return with that in a few days. You will be able to see what other bloggers have chosen over at Veg Plotting. Make sure that you have pen and paper in hand when you visit! Garden Bloggers' Bloom Day ~ February 2014. Hopefully regular visitors to my blog are not suffering from a surfeit of snowdrops. If so I can only apologise. I was hoping to post other than just more white petals for GBBD but today's foul weather is conspiring against me. So instead I made for the sanctuary of my greenhouse where there were one or two snowdrop flowers clamouring to have their photo taken. Sadly there are also some past their sell date, some that have still to open and others that were simply too cold to want to come out today otherwise I would have shared more of them. Please click on the collage if you would like a close up view. Galanthus 'Alan's Treat' - one of the most expensive snowdrops that I've ever bought. I could not resist this after I saw a clump of it flowering elsewhere as my Dad's name was Alan. The name of this snowdrop came about from a clever play on words being named after Alan Street, who is head nurseryman at Avon Bulbs. I wanted to show you an open flower as apart from the markings it has a most interesting shape but it would not oblige today. 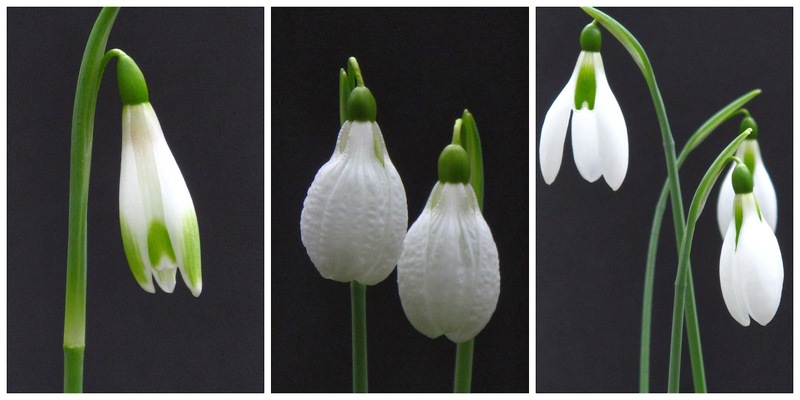 Galanthus plicatus 'Augustus' - this one does not break the bank, spreads nicely and has a beguiling 'seersucker' effect to its petals as do some other plicatus snowdrops. The flowers are quite chubby when open whilst the leaves are quite short and broad. Galanthus plicatus 'Sally Passmore' - a new to me bulb this year from a local source namely Cornovium Snowdrops. Already a more than welcome addition to my 'Fair Maids of February'. For other February flowers please visit over at May Blooms Gardens, where the lovely Carol kindly enables to share our blooms each month with other garden bloggers. Just the prefect remedy for such a day. PS My next post will not mention the word snowdrops - promise! 'The Untidy Gardener' is not only the title of one of the gardening books on my bookshelves but could just as well be applied to me. This tendency sometimes has drawbacks but sometimes bring unexpected pleasures. As yet another rainy day rules out attempting any jobs in the garden, I waited for a clear break in the skies and briefly squelched round the estate earlier this afternoon. The area behind and at the side of the greenhouse is a bit of a dumping ground and is in need of a blitz to make it more respectable. I spotted a hellebore seedling growing out of the slate chippings there either two or three years ago. 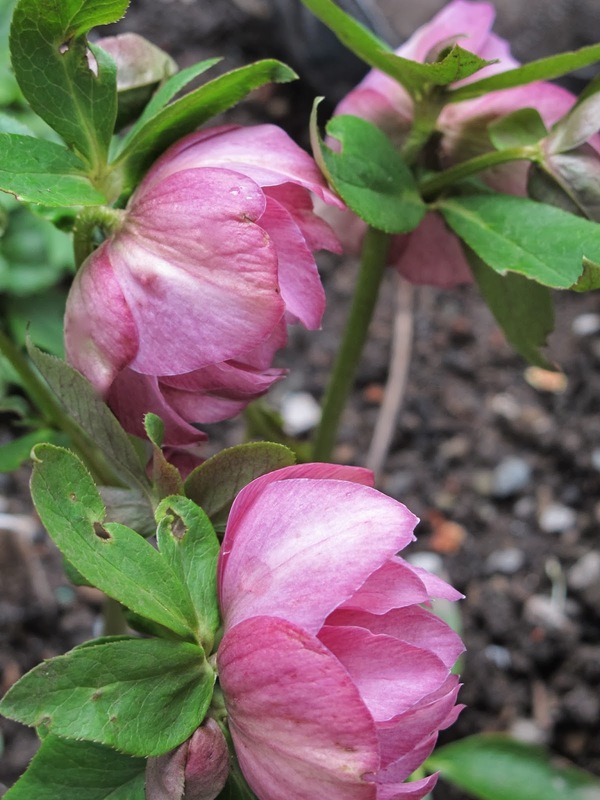 I debated pulling it out as I already had other hellebore seedlings vying for my attention. I debated potting it up. I debated whether to just leave it where it was to see how it would get on and that is what happened. This hellebore was winking at me when I came across it today - not perhaps a star amongst hellebores but still much appreciated. 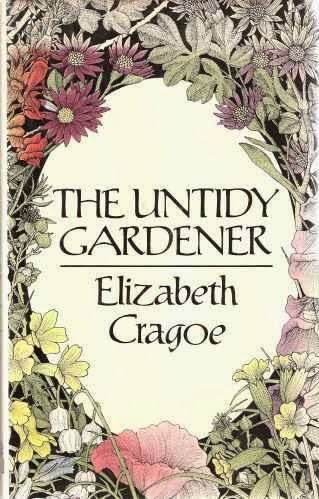 'The Untidy Gardener' by Elizabeth Cragoe was published in 1984 and although the book is no longer in print it is still possible to find second hand copies. The author is faced with tackling three and a half acres of overgrown land surrounding the house as she creates her garden in west Wales. Apart from a garden plan at the front the rest of the book is without drawings or photos but the words are sufficient. The author's main interest is in growing wild flowers and she writes "I want the garden, ideally, to develop in such a way that it does not demand too much in the way of actual gardening. As I get older , I trust that the trees and shrubs that I am planting now will, in growing up to maturity, take over a good part of the decorating of the garden, and that the wild flowers , whose cultural requirements, once understood, are simple, will do the rest ... It is partly because of my predominating interest in growing wild flowers that I have called this book 'The Untidy Gardener' ; but, really, another word is needed , a word that implies not so much the opposite of tidiness, as its irrelevance - 'a-tidy' rather than untidy. Wild flowers want to grow very freely, but, in their heyday anyway, they are seldom messy". What about you - would you have pulled that seedling out or allowed it to grow on? "In February, the gardener carries on with the jobs of January, especially in cultivating the weather. For you ought to know that February is a dangerous time, which threatens the gardener with black frosts, sun, damp, drought, and winds ; this shortest month, this addle-egg among the months, this aborted, leap and altogether unreliable month, excels them all with its wily tricks, therefore beware of it. During the day it wheedles out the buds out of the bushes, and at night it blisters them ; with one hand and it cajoles you, and with the other it makes you feel a fool. God only knows why in leap years one day is added, just to that wayward, catarrhal, sly, and stunted month ; in leap years one day should be added to the beautiful month of May, so that there there would be thirty-two, and all would be well. What have we gardeners done to deserve that?" At least we have snowdrops and other early flowers for some comfort and cheer this month. Much too wet to take any photographs this afternoon, so here's some snowdrops from last year's February garden.